A while back I promised you a rant about people substituting pets for human relationships. This is a major pet peeve of mine, and I've had a hard time putting my thoughts into coherent sentences. In my head they sound like a Lewis Black routine! Anyway, here you go. The other day I was behind a car with a bumper sticker that read "Animals Are Just Little People In Fur Coats." Immediately every fiber of my being yelled "NOOO!" Besides being scientifically incorrect (c'mon, even a toddler knows this) metaphorically this is bad thinking. And I think it does a disservice to the animals. Take dogs, for example. Dogs are a distinct, sentient species with their own thought processes, feelings, drives, motivations and priorities. When people assume dogs think like we do, you end up with idiots like the guy in Tennessee who claimed his dog was gay and dumped it at the local shelter. I'm not making this up! On the not-so-extreme side, I've known animals that were punished for wrong assumptions. Have you heard variations of "The dog is ignoring me on purpose" or "He destroyed my shoe out of spite?" Sadly, the truth was probably closer to "He's ignoring me because he doesn't understand what I want" or "That smelling spot is more interesting than you" or "Last time he heard that tone he was hit with a newspaper so now he's hesitant to come." And perhaps a shoe chewing is done out of boredom, or frustration, or anxiety. Or maybe it's just a lot of fun! Another one of my pet peeves is when people refer to pets as their children. I have both children and pets. They are not the same thing! Anyone who knows me (or has read this blog!) knows that I adore -- and often indulge -- my animals. I enjoy their company and work really hard to make sure they are happy and healthy. I've bought furniture and vehicles based on how "dog friendly" they were, and I spend a good portion of my disposable income on quality food, veterinary care, pet supplies and unnecessary toys. However, my animals will never be on the same level as my children. Sometimes I prefer the company of my dogs, but I would sell my soul for my boys. 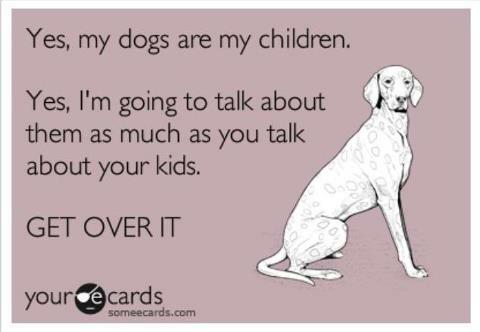 I would inconvenience myself for my dogs; I would lay down my life for my children. There's a difference. And I feel that treating dogs like human children, instead of the wonderful creatures that they are, is unfair to the dogs. It makes them neurotic and unstable -- and very often fat. Dogs want to run and play and chew and sniff and roll in stinky things. They don't want silly outfits or birthday parties or $365 Louis Vuitton dog collars. If you're going to give those things to your dog, at least be honest with yourself about who you're really buying them for. And then take your dog to the park so he can pee on unfamiliar trees -- that's what he really wants. 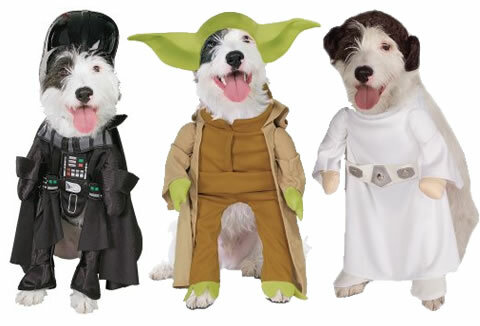 Dogs in Star Wars costumes -- hilarious!